The current theme over at Cookbook Lovers Unite is "Warm and Cozy." Daylight savings time has ended. It's dark outside, and, here in New England, it's getting cold. Even on days that reach the 60s during daylight hours, it is dropping into the 20s and 30s at night. I'm not quite sure where summer went. As a matter of fact, I feel like it was just yesterday that I was out picking strawberries. But, somehow, it became November. This is particularly astonishing to me because I so clearly remember this time last year. I was a bundle (a very large bundle) of anticipation. With each passing week, I was getting more and more anxious to meet my baby. At every store, I'd feel a twinge of nervousness when I saw the holiday displays. That means this baby is really going to arrive!! And now, here I am, with an 11-month-old baby. Where did the time go? Oh yeah. This post was supposed to be about lentil soup. So, based on the Cookbook Lovers Unite theme, I browsed through my Nigella Lawson cookbooks. Because, to me, when you mention needing a "warm and cozy" recipe, I think of Nigella. There's something so homey and comforting about her books, her personality, her recipes. I am on a never-ending search for the perfect lentil soup recipe I ate it once, at a restaurant in Florida. I was visiting my Grandma, and it came with my meal. I can't remember the name of the restaurant. I only remember the perfect lentil soup, and the regret I now feel about not asking for the recipe. What was the worst thing? They said no? Now I'll never know. So, I search and I search. 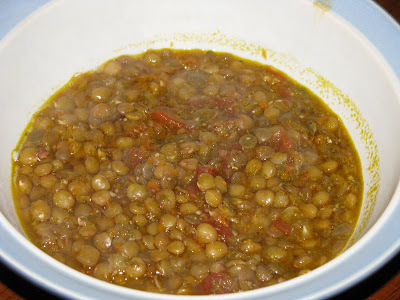 I make lentil soup recipe after lentil soup recipe, and, sadly, it's never the one. This one looked very promising. Pancetta? Scallions? Carrot and celery and garlic, all pureed? Sounded perfect. It wasn't. It was a decent lentil soup. But it wasn't perfect. It wasn't that golden bowl I ate in Florida. And so the search continues. Put the carrots into a food processor with pancetta, scallions, parsley, thyme and garlic. Process to a mush, and then heat the oil in a Dutch oven and cook over medium heat, until they are soft. simmer gently for 1 hour or thereabouts. I'm sorry this wasn't the soup of your dreams and I do hope you find it someday! I saw many bloggers making this soup but I never tried lentil soup before. Will try to get the ingredients and make lentil soup one day. Love this...looks so good right now on a cold night! I agree...you can't go wrong with Nigella Lawson when you want warm and cozy! Sorry the soup wasn't the one you were searching for, but it looks delish nonetheless...hope you find "the" soup soon! I am a lentil soup lover - the recipe sounds warming and delicious! I grew up on Lentil Soup and I have to make it at least twice a month. I buy my lentils from a Greek specialty shop in Queens, New York. They are tiny and absolutely delicious. They make such a big difference. Lentil Soup with homemade bread and I am completely satisfied!!! I promise these tiny lentils will make the difference. All my friends are hooked on them.